To kick off the commemoration of the 125th anniversary of the Homestead strike, I examined the lessons of the decades-long interdependence of the town’s merchants and millworkers. A longer version of the following was delivered on the third floor of the Rivers of Steel Museum, formerly known as the Bost Building. I began by re-telling the story of the strike from the perspective of Homestead’s community. This part of the talk I later recorded. 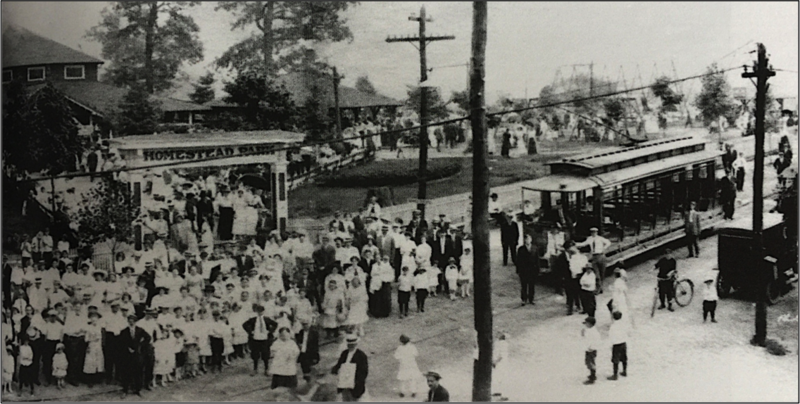 Observers claimed the entire town arrived at the banks on the Monongahela on the fateful morning — union and non-union, Carnegie and non-Carnegie workers; Americans and foreigners; even women and children in shocking numbers. None of them listened to the Advisory Committee’s cries for restraint. They ripped down Frick’s fence and rushed across the mill grounds to the wharf, where they gathered opposite the Pinkerton barges and screamed for blood. The confrontation hadn’t even begun, and the Advisory Committee had already lost control. The committee pointed to the chaos and begged the Pinkertons not to land, but their captain would not be dissuaded. Within moments of the their gangplank hitting the shore, violence broke out — first clubs, then gunshots. In the initial melee people died on both sides. 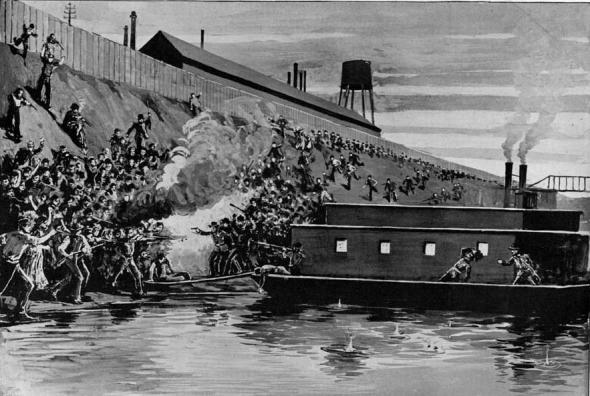 Their day-long attack on the Pinkerton barges and their physical assault of the Pinkertons after they surrendered have become legendary images in American history. All of Homestead was implicated in that violence, too. They won the battle, but lost the war when the Pennsylvania state militia, at Frick’s behest, occupied the town, enabling him to re-open the mill with non-union labor. The union hung on for months, but had to call off the strike just before Thanksgiving. I went through the strike in such detail to give you a sense of what was lost on a community level. Homestead was a remarkable town before the strike, a place where people of all backgrounds united to protect the rights of one class of workers – the most privileged, to be sure – and that unification set the tone for how the rest of the town conducted its business, up to the highest levels of governance, the borough council, where the union leaders led as well. As the strike dragged on, a depression settled on the town. Steel workers couldn’t work, so they didn’t have money. Merchants sold to them on credit ‘til they couldn’t afford to. Property values were depressed. Taxes went unpaid. Homestead exited the strike a broken place. The men who participated in the strike were forbidden by the company from resuming work in the mill. The town had to organize charitable efforts. Some local merchants protested they shouldn’t have to give, since they were still selling on credit. Others did contribute. When contributions started pouring in from around the country, however, some citizens were embarrassed and protested that things weren’t as bad as people thought. By March the paper claimed that only a few families were struggling, but there were other signs that all was not well – fighting in the streets, unclean living conditions in the immigrant neighborhood. The town needed paving and sidewalks and curbs and sewers and a ball field and a new school. Setting a precedent for the future, the ball field came from steel magnate Charles Schwab. It took the remainder of the decade for paving and sidewalks and curbing to cover the main parts of the town. The tax problem never improved; the area east of Homestead was declared in 1901 a separate borough, Munhall, in a bit of tax gerrymandering that permanently impoverished Homestead. In a later period, the steel company would step in on some of these municipal projects. Getting all the residents of the town clean water took decades, and rooting out the rampant crime even longer. Who would become the new leaders of the town? Who would look after the needs of residents? What would the be the new culture of the town? How would Homestead become a place where people lived, and not just a place where they worked? The first group to step into the void, naturally, was the steel company itself. 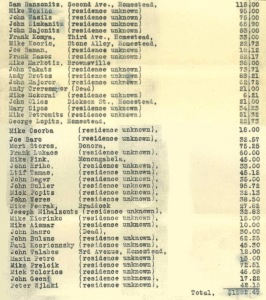 The post-strike wages enfeebled the steelworkers, but the steel company made up the difference – or so they told themselves — with company-provided welfare, which manifested itself in large ways and small. The Carnegie Library, the Charles M. Schwab School for the Manual Arts, and Frick Park were all very public gifts made to the town. For the workers directly, the company created a stock purchase plan and programs for safety, accident-insurance, and pensions. Through housing and sports programs, the company targeted the workers’ home life and recreation time. The whole approach was extremely paternalistic and undemocratic. The steel corporation decided what people needed and gave it to them. What the corporation provided amounted to real contributions to the cultural life of Homestead and the social safety net for workers, but the manner in which it was given was resented. And without fundamental changes in wages and hours, the efforts fell short for the neediest workers. After the steel company, there was a second group to step in, a group which wan’t bound to the workers in the same way: the town’s business men. There were managers of the steel works, up to the superintendent himself, acting in their capacity as individuals. There were professionals – the town’s doctors, lawyers, bankers, real estate agents. The largest class were the town’s merchants, who had a vested interest in the life of the place where they sold. They wanted to ensure their shops remained in large, vibrant communities. In all of these groups – mill managers, professionals, and merchants – there were opportunities for the American dream to play out, for someone to start on the bottom and end on top. Carnegie, Frick, and a surprising number of their cohort fit this rags-to-riches archetype. But rarely was it as rapid and as pervasive as in the merchant class. Morris Frankel ran a clothing store and made his fortune investing the profits in local real estate. He became Homestead’s first Jewish councilman in 1907. H.L. and Ben Little were two of the three Little brothers with shoe stores on Eighth Avenue. The Little’s shoe store that is today on Forbes Avenue in Squirrel Hill was founded by the third. Joseph Lasdusky had the leading ladies’ clothing store. He was the first Jew elected to the school board in 1906, became president of the school board in 1910, and was responsible for building the high school building. The Half Brothers had perhaps the largest store in town. They started off selling furniture and home goods, but expanded in the late teens to women’s clothing. They never lived in Homestead, but from the start they played a large role in the community. 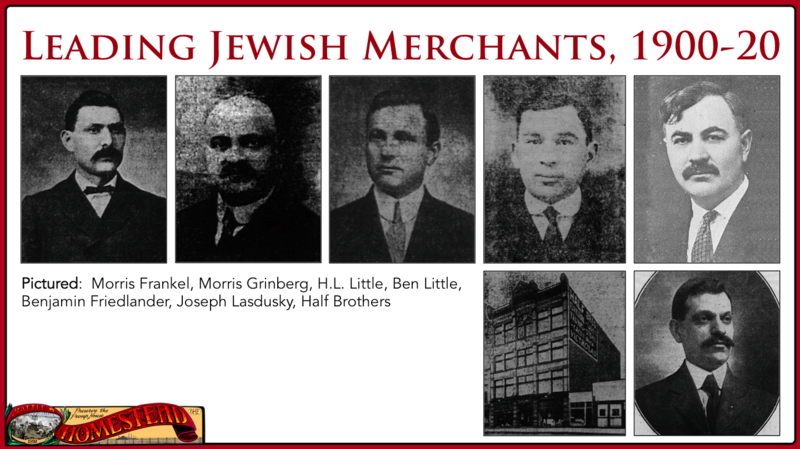 All these men, and and the many more Jewish and non-Jewish merchants who ran stores in Homestead, had an opportunity to stand in the front-ranks of the community. Still, there were no guarantees. 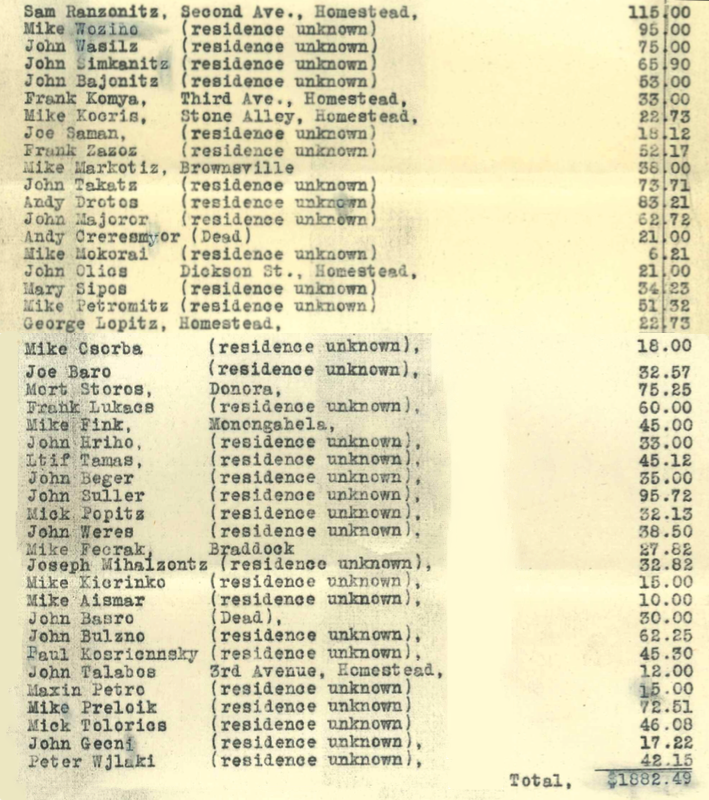 Take this list of creditors from the bankruptcy file of my great-great-uncle (at right). His customers were Hungarian laborers in the steel mill. When they got paid, he got paid. When they did not, he sold on credit. When times stayed bad for too long after the Panic of 1907, he overextended himself. At the time he went bankrupt he owed his creditors $1,786.55… but his customers owed him $1,882.49. If they could have all paid him, he would not have gone bankrupt. In a place like Homestead the circumstances that inhibited the steel workers affected the merchants, too. Both groups depended on the steel mill to continue to provide work so that money would continue to flow. Hard times in the mill affected all Homesteaders. The town’s economy never diversified, so as went the mill, so went the town. The steel industry often went through expansions and contractions. An expansion meant that steel workers were employed full-time, while a contraction meant that many were employed part-time, if at all, but in all cases the men were paid poverty wages. As we’ve seen, in the absence of unions the steel company claimed to provide for the workers, but the wage scale and work conditions created a persistent gap between the company’s efforts and the workers’ actual needs. Into this gap stepped the town’s business men, the new leaders who emerged after the union was routed. 2/12/1908, post-Panic of 1907. Note the call for a mass meeting — this step was required because after the strike, mass meetings were illegal! 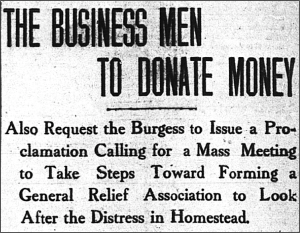 On a couple occasions after the strike, significant industrial depressions spurred the business men to organize their own local relief organizations — once after the Panic of 1907, and again after the start of WWI. They threw benefits to raise money, printing the names of donors in the paper as a kind of peer pressure, and organized a system to disburse the funds. Their outlook included the notion of the “worthy poor,” so a woman with a drunk husband might not pass muster, but they generally attempted to assist all who asked. Those in the appropriate positions to do so lowered rent and coal prices. These two, general relief efforts were only the tip of the iceberg. The business men and their wives, the so-called society women, started a “summer playground” (day camp) and a “community day nursery” (day care) to look after children. They organized a “curb market” (farmer’s market) to bring in fresh fruits and vegetables. They raised money to found a local hospital, support its ongoing needs, and eventually expand it — an especially important endeavor given the injury rate at the mill. 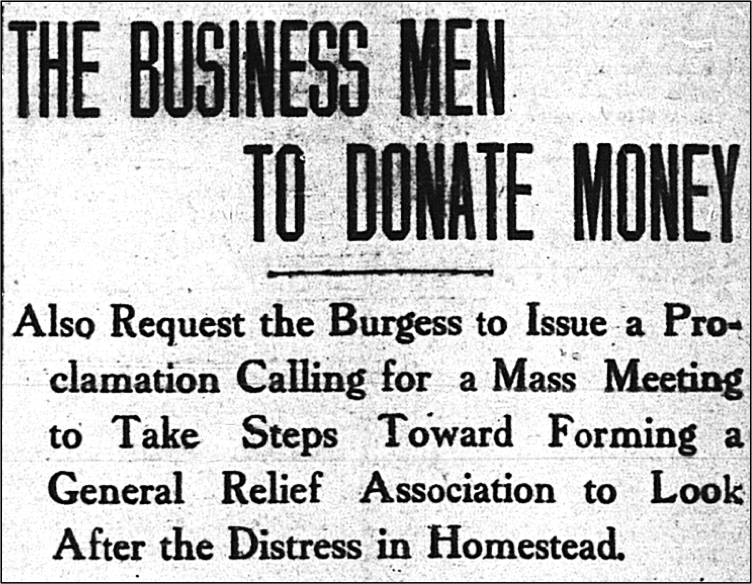 In short, many of the services working families needed came from Homestead’s business community. The business men lobbied borough council around many of the basic services of the town: street cars, roads, water, and mail. They were especially vocal around clean-up efforts, which happened annually in an age fraught with communicable diseases (and especially necessitated by the sanitary conditions in Homestead’s poorer neighborhoods). The town’s newspaper recognized their effectiveness and sometimes addressed them directly on the front page or in an editorial to exhort them to take up a particular cause. Even representatives of local groups, like the crusading reverend of the Hungarian church, asked them directly for their assistance. This was how things got done. 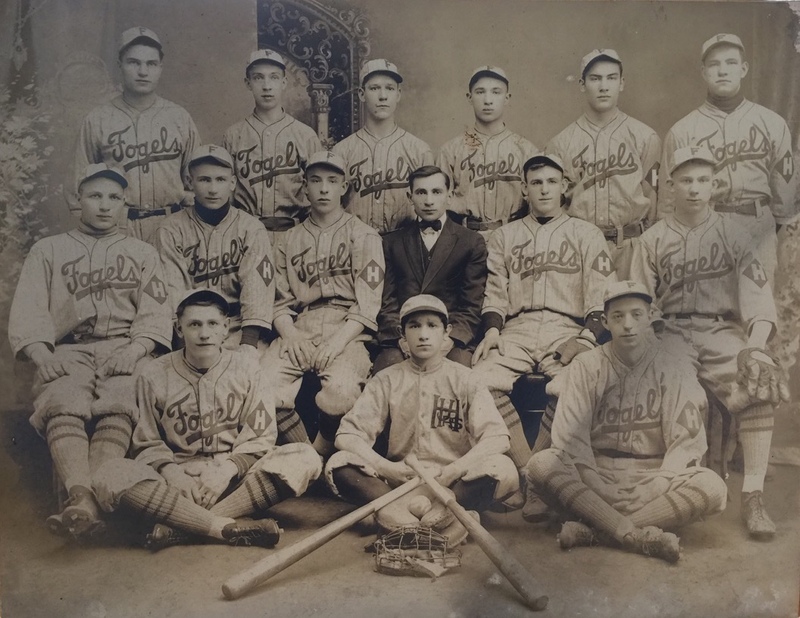 The Fogels were a youth baseball team supported by the Jewish proprietor of a candy store. The business men assisted in the town’s recreation, too. Individual merchants sponsored local sports teams. They also funded and ran Homestead’s annual Hallowe’en parade, which began in 1907 and attracted people from all over the region. The business men were expected to handle this event; if it got too late into October with no word, the paper would publicly complain that the business men weren’t stepping up. Besides filling many different committees covering every aspect of the event, they donated prizes for costumes and built elaborate parade floats. 10/28/1909. 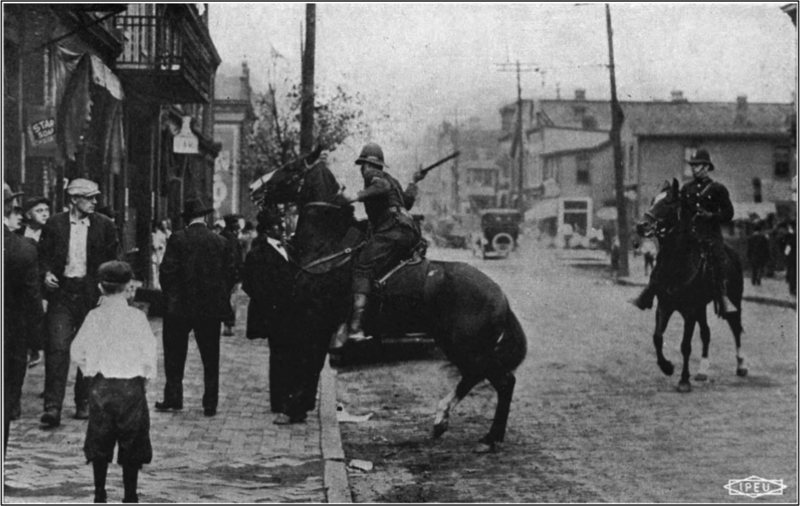 In 1908 and 1909, the business men brought in the “famous” Monongahela KKK band to lead the Homestead Hallowe’en parade! Another annual event they sponsored was the Business Men’s Field Day & Outing, which was a town-wide day off. Everyone was invited to a day of picnicking, dancing, sports, vaudeville, moving pictures, and other fun. It grew to attract tens of thousands of attendees. All these efforts, both vital and frivolous, were presided over by the town’s leading business men, and despite the social segregation between Jews and non-Jews, the leading Jewish merchants I introduced earlier were often at the forefront. This lovely picture of girls in white dresses and boys in white shirts and men in suits at the annual picnic makes me wonder, though: were these activities reaching all the neediest Homesteaders? Would a contemporary reader have understood something I cannot about who was inside and who was outside of these efforts? Were the poorest of the poor welcome? Were people of all ethnicities and colors? Homestead’s paper projected clear attitudes of xenophobia and racism, linking social ills that stemmed largely from poverty instead to faulty character. Given that there was obviously a sharp split between the English- and non-English speaking communities and between whites and Blacks, I have to wonder if that extended to philanthropy. Between the steel company and the merchants, much was undertaken in an attempt to improve the condition of working families. Today it’s hard to look past offensive norms to evaluate their efforts by their standards. The post-strike period was one in which philanthropy was guided by a sense of superiority of donor over recipient. The steel company created welfare programs without raising wages, for example, because they believed the men would drink their raises away. The business men did not push for improved water and sewage problems in poor neighborhoods, because they believed the people who lived there had bad hygiene. Nevertheless, it was an era when moral obligation meant something; the prevailing value system demanded something of everyone at the top, and by the standards of the day they largely met their commitments. Gaps were filled, and something of a social safety net was cobbled together. However, at the outbreak of WWI most steelworkers made lower wages than before the Homestead strike. Factor in the increase in the cost of living, and their circumstances look even bleaker. Half of the men worked twelve-hour days; half of them worked seven days a week with a double-turn (24-hour shift) every two weeks. Conditions in the mills remained harsh and ruined men by age forty. When they weren’t working, they were too exhausted for family life, education, or recreation. Sports, parades, libraries, night school, outings — they had no time or energy for these activities. Day care and hospitals filled a need without solving the underlying problem. Relief efforts during depressions helped, but their conditions were permanently depressed. The system of philanthropy gave these families no say, and nothing could overcome the poverty to which their wages chained them. But the strike rent the social fabric of the workers’ communities, and they were forbidden to rebuild it. The corporation spied on the townspeople to detect union stirrings as early as possible to fire the offenders. Neighbors spied on neighbors! Workers could be blacklisted for years if they actually participated in labor unrest. The pervasiveness of the steel company’s espionage system left workers helpless to change their circumstances. “If you want to talk in Homestead you must talk to yourself,” a Homesteader told a sociologist studying the town in 1908. For a generation since the 1892 strike, the steelworkers could not speak up for themselves, and few dared to speak up for them. September 23, 1919. This famous photograph of a Homestead hotel keeper being beaten by a state constable during the Great Steel Strike was taken a block from my where my family lived. My great-uncle A.C. Hepps witnessed the victim’s statement. After WWI the built-up resentment exploded. Another strike broke out in 1919. Once again, outside forces arrived to suppress the strikers. Once again, there was violence in Homestead. Once again, it did not lead to greater rights for the workers. The non-union era persisted until Roosevelt personally intervened in 1937. A rarely-seen inside view of the main gate of the Homestead Works. Homestead’s heyday came in the 1950s during the post-war boom. The mill was once again working at full capacity, but this time the steel workers shared in the bounty. Businesses thrived, because people had money to spend. Eighth Avenue was the place to see and be seen on Saturday evenings. It was an era of renewed civic commitments. 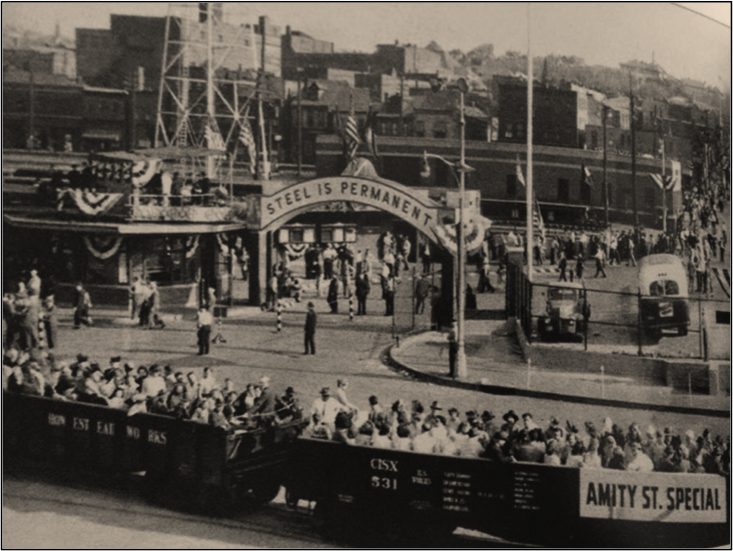 Steel workers and union leaders were able to freely participate in the life of the place. 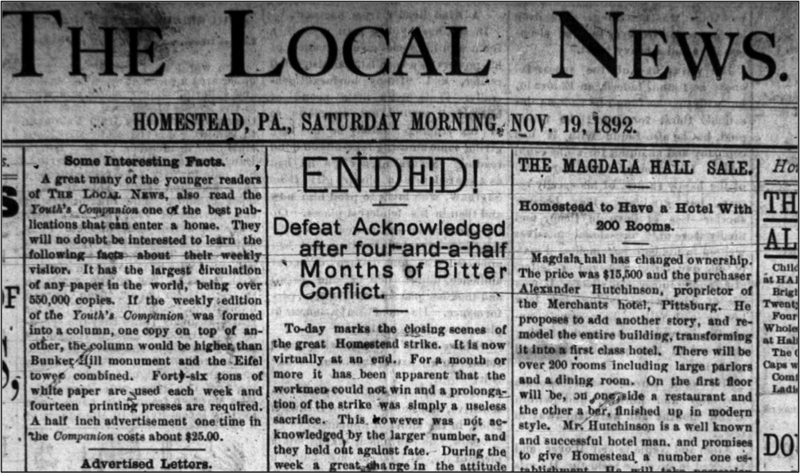 It was not the labor republic that had prevailed in Homestead before the 1892 strike, but it was something closer to democracy than Homestead had known in many, many decades. In any community we all depend on each other. The channels of interconnectivity may not be as clear as in Homestead where there was a straightforward flow of money from steel mill to millworkers to merchants, but they’re there. Then as now, oppression of one group imperils the rest. Looking at the successes and failure of this interconnectivity in the period between the 1892 and 1919 strike, what are the lessons of this history for us? Civic engagement. However uncomfortable the paternalistic attitudes of the past now seem, we must acknowledge that those who found themselves in leading roles in Homestead did try to improve conditions in the town. They believed themselves obligated to do so, and they followed through with their time and energy and resources. They knew something about being good citizens that has since faded. Listen and learn. If they fell short, it was because they did not ask the steel workers what they needed. In part, they assumed they knew better. In part, they were uncomfortable with those unlike themselves. Living in an era that values dialogue, we must engage in difficult conversations and follow through.